BBC keeps trying to make some equivalence between the threat of Islamic terrorism and that from the Far-Right….but even its own report shows that is nonsense…. This was out of a total of 205 potential or successful attacks recorded by European intelligence agencies, with 137 “separatist”, 24 “left-wing” and 33 “jihadist” plots among them. So 5 FR plots and 24 left-wing [not even ‘Far-Left’] and so remind me why the BBC thinks the Far-Right is the greatest threat? The Global Terrorism Index tells us that from 2002-2017 there were 96 deaths from FR terrorism….most of those by Breivik of course. In the same time there were 2,436 deaths caused by terrorist attacks….vast majority by Islamists. And yet the FR is the threat the BBC wants to prioritise. Note the GTI is nearly all about Islamist terrorism….the FR barely gets a mention. OK…what can we learn from Brenton Tarrant’s ‘manifesto’? History tells us that the development of new ideas of governance and government require people to think radically. Extreme views are necessary to test the wisdom of the mainstream. It is one thing to legislate against activities which can be demonstrated to incite violence or hatred. Quite another to pass a law that can silence anyone who the government thinks has “dangerous views”. What would Churchill, Gandhi or Mandela think? \\ Mr Charlesworth said he has met with North Wales Police today in order to discuss their plans for the first go-slow protest on Friday at 6.30pm- instead of 7pm as originally planned. The protest will run between Deeside Industrial Estate to St David’s Park in Ewloe and is likely to take around an hour, with several journeys between the two sites. A short rally will then take place on the industrial estate. I wish the UK lorry drivers who voted Brexit would block every main road, entrance to Parliament, airports, roundabouts, throughout the UK and stay there while being fed and watered by the locals in every location the blockages where. My opinion is that this would be catastrophic for this PM and Labour. The French strikes by their lorry drivers ALWAYS achieved (s) a total collapse in French politics, the pressure being so bad on their parliament that many leftist laws were trashed even before they got off the ground. There is a tweet showing some footage of uniform police officers going to someone’s home and telling someone who put a non criminal comment on twitter and being told to “ mind how he goes “ . It ends with the idle threat that if his comments had been criminal the visit would have ended “differently “. Hard to imagine this happening in Britain . We seem to have our very own starsi – complete with informants , being denounced and censored . I’m starting to worry about the existence of this website. Is this website hosted in the USA? Yes it appears so Dover but I don’t thing The State woukd have much trouble denying access. The contingency plan for shutting down bits of the Internet if the politicians don’t like what they see after 29 March will be well laid out by now . After all we know whose side they are on and it’s not the democratic majority . When you see something like that you thank god that their numbers have been cut . But I bet the ones remaining are doing nicely on the overtime . TOMMY Robinson’s ‘contempt’ case at the Old Bailey that was due to take place on the 22nd March relating to contempt of court has been adjourned until at least May. The activist, who was unlawfully jailed last year will have more charges brought against him in May after the British Government deemed it was ‘the public interest’ to do so. What BBC Vic Derbyshire reporting on pimping by Arabic speakers ! "The intelligence suggests they're branded with a tattoo of their owner's name in Arabic"
“The intelligence suggests they’re branded with a tattoo of their owner’s name in Arabic”. That must surely mean that the, “owner’s” wish to conceal their true race by using Arabic to imply they are, Arabs. Any bets the “owner’s” will turn out to be elderly British white males? They’ve always had a penchant for slavery, but of course never get flak for it, only whitie. “A devout Catholic and mother of five has been asked to attend a police interview after being accused of using the wrong pronoun to describe a transgender girl. Nice to know as stabbing, hit and runs etc., become commonplace the police are not being distracted from investigating serious criminality. I self-identify as a schizophrenic and demand to be referred to as ‘they’. "These MPs, they're a disgrace, they're just squabbling amongst themselves. They're not!" – Former Prime Minister Tony Blair says he believes MPs "owe their constituents their own judgement" and May's deal "resolves nothing"
Blair is as repulsive as usual . I wonder how much Soros pays this barrister ? But I thought everyone had finally realised how replusive he is. So how could it be imagined he could help a campaign? He has helped the Leave campaign certainly. What the entire bbc does not know, or wants to…. How do they count these things though? even though that’s their main income ? Just asking – not judging people just doing their best to survive . productivity ? GDP per head ? 10pm news on BBC 1 and floods (was it Mozambique?). I was so enraged about the gloating of Sophie Rayworth as she asked David Shukman if it could have been caused by climate change. Shukman responded by saying we couldn’t be certain (BBC twisting response to prove their impartiality) but the floods would have been made by the seas rising due to melting polar regions. (How much sea levels had been rising, had I thought been less than 5mm if at all) plus Shukman explained that water sodden land caused by climate change would make things worse. Sorry if the last bit is very vague, I didn’t think it worked as an argument using the science laws I was taught in school and my blood pressure was over the legal limit. This was report was from South Africa I believe. As a scientist said, “The opinion of a scientist is not necessarily science”. Actually that prog is one of the few that hasn’t been purged. It’s great service the way that instead of just giving PR to a view, Dr Margaret is bright on to challenge it, and often debunks it. Watched c4 state news for the first time in a long time . They are going full Grenfell on the New Zealand ‘incident ‘ and it looks like it’s going to run for days – and then start again when the trial starts . Maybe someone will ask the NZ PM why semi automatic weapons could still be purchased in NZ …. … also .. it looks like there is gonna be a whip round for the latest African storm …. I don’t know whether David Lammy MP will be objecting to such a post colonial insult because -mas we all know – Africans can do it for themselves …. Sort of O?T but Climate Chege. 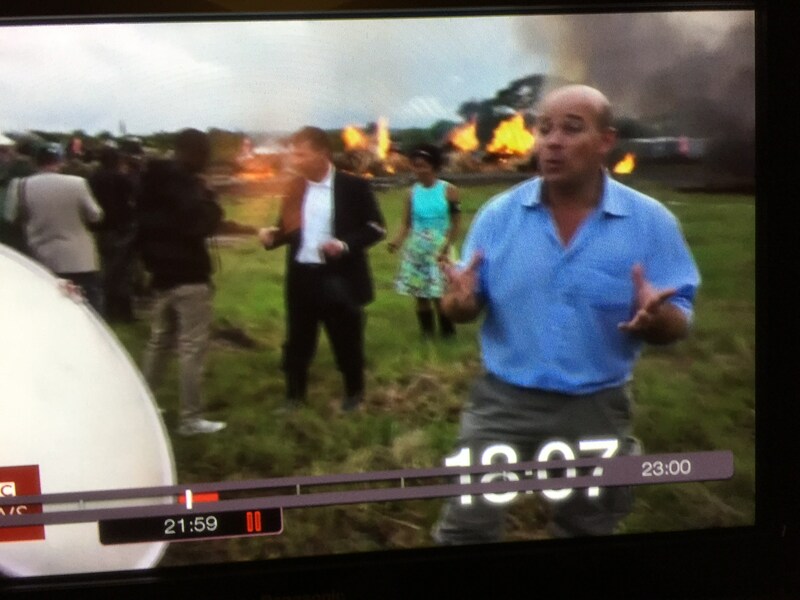 On R4 this morning the reporter said there were only 4 helicopters to deal with the latest African floods and then went on to describe how he and his camera crew used one of them to find out how bad it was. He even said they had landed in a stadium where 600 people told them that they had no food or water. What the hell is a reporter and film crew doing wasting life-saving resources like that? Surely it could have been helping?